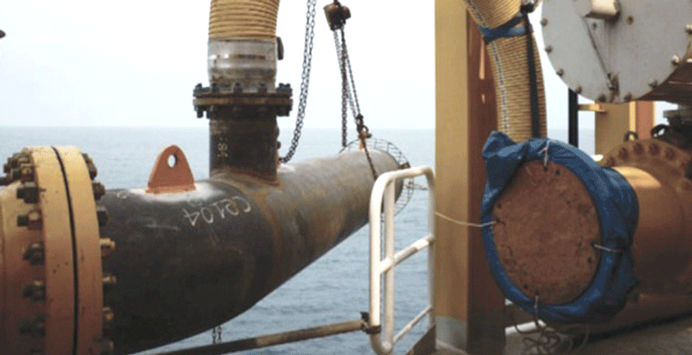 The company was operating an FPSO offshore West Africa and suspected that a temporary metal flange plate, used to prevent debris entering a 20” flowline, had fallen inside. The operator did not have any pigging facilities and even if they had they could not risk putting a conventional pig, or even a foam pig, through the system as there would be a possibility of it getting stuck if it encountered the metal plate. EVO-Pig does not need conventional launching and receiving facilities. EVO-Pig will negotiate restrictions where conventional pigs would stick, requiring back flow and/or mechanical intervention to clear the line. EVO-Pig can be driven by fluids or gasses. If the pig was recovered undamaged without carrying the plate then this would show the plate was not in the line. There were a number of issues which we needed to overcome to make the EVO-Pig a viable solution. The project was urgent so there was not enough time to fabricate a pressure vessel to launch the pig from. The pig would have to a pass a 20”OD tee undamaged, since such damage could be confused with damage caused by the metal plate, and invalidate results. The pig must be recovered for examination but the FPSO does not have any preinstalled receiving facilities. After detailed discussion with the operator and their sub-contractor a decision was taken to run an EVO-Pig from the portside offloading line and recover on the starboard side. This would be a distance of approximately 3.5km through 20” OD pipe. 1. The operator identified a 2m spool piece on the port side of the FPSO which would be utilised as both the mould for the pig and its launch vessel. 2. Aubin supplied the EVO-Pig in the form of two liquid components which were mixed on the FPSO. To aid quality assurance during mixing the material changes colour to pink when the EVO-Pig is properly mixed. 3. The spool was greased, capped and set in a vertical orientation. 4. The EVO-Pig liquid was poured into the spool then the mix was left to set for 24 hours. 5. The spool containing the pig was bolted onto the portside offloading line. The pig was launched and propelled with water. 6. A second, longer spool was installed on the starboard side of the vessel to act as a pig receiver. A grate was fitted to the end of the spool to catch the pig, whilst allowing water to exit. 7. The EVO-Pig was propelled through the offloading lines from the port side to the starboard side of the vessel, passing through the tee, and was recovered in the temporary launcher. 8. The pig was removed from the launcher and examined (pictured below). The pig was recovered intact and the missing plate was not pushed out with it which meant that it had not been present in the line. Clarification on the pipelines contents and integrity was essential for the operator, who considered the project a complete success. The operator was delighted to find a solution that could quickly offer clarity and that they could blend and set-up with ease on-site using their own pipework. The EVO-Pig passed cleanly through the pipeline and negotiated a tee bend, detecting that the metal plate was not present in the line. EVO-Pig is a safe, risk-free and easy to launch solution for debris detection in the pipeline.